Background: Despite prolonged disease-free survival and overall survival rates in Estrogen Receptor (ER)-positive patients undergoing adjuvant treatment, Tamoxifen therapy tends to fail due to eventual acquisition of resistance. Objective: Although numerous studies have emphasized the Role of Receptor Tyrosine Kinases (RTKs) in the development of Tamoxifen resistance, inadequate clinical evidence is available regarding the alteration of biomarker expression during acquired resistance, thus undermining the validity of the findings. Results: Results of two meta-analyses investigating the effect of HER2 status on the prognosis of Tamoxifen-receiving patients have demonstrated that despite HER2-negative patients having longer disease-free survival; there is no difference in overhaul survival between the two groups. Furthermore, due to the intricate molecular interactions among estrogen receptors including ERα36, ERα66, and also RTKs, it is not surprising that RTK suppression does not restore Tamoxifen sensitivity. In considering such a complex network, we speculate that by the time HER2/EGFR is suppressed via targeted therapies, activation of ERα66 and ERα36 initiate molecular signaling pathways downstream of RTKs, thereby enhancing cell proliferation even in the presence of both Tamoxifen and RTK inhibitors. Conclusion: Although clinical findings regarding the molecular pathways downstream of RTKs have been thoroughly discussed in this review, further clinical studies are required in determining a consistency between preclinical and clinical findings. Discovering the best targets in preventing tumor progression requires thorough comprehension of estrogen-dependent and estrogen-independent pathways during Tamoxifen resistance development. Indeed, exploring additional clinically-proven targets would allow for better characterized treatments being available for breast cancer patients. 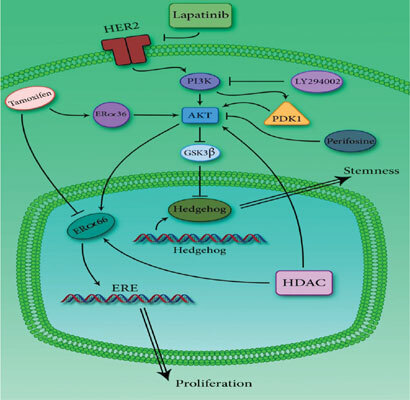 Breast cancer, Tamoxifen resistance, RTKs, molecular interactions, ERα36, ERα66.